Farm Machinery Consignment Auction: The last Saturday of March and Sept. at 9 am. 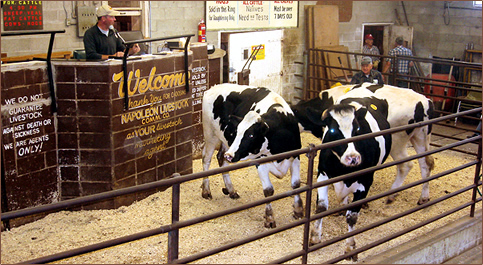 Welcome to Napoleon Livestock Commission Co.
At Napoleon Livestock Commission we offer professional and friendly service, expert advice, and also auction services for estate, household and farm auctions on your site. We are the oldest family-owned Livestock Auction Market operating since 1956 in Michigan and in the 4th generation of experience in marketing knowledge and assistance to agriculture needs. Our family operation is here to serve you with your livestock needs in procurement, marketing and trucking service with either a semi-truck and trailer or a gooseneck trailer. We offer for sale trailers, trailer parts, farm gates, livestock equipment and supplies. "Together We Have Over 128 Years of Marketing Experience!" For more information, please email us, call us at (517) 536-4201, or simply stop by. Copyright © 2019 - Last Modified: April 02, 2019. All rights reserved.